Haha sick! But next time don't worry about slipping the clutch, just let your tires peel out until you can get going. It's a hell-of-a-lot cheaper to change two tires than to change a clutch. "The lead car is absolutely unique, except for the one behind it which is identical." – F1 commentator Murray Walker. Here's what I tow behind my manual 2011 yaris. Under 1,000lbs. 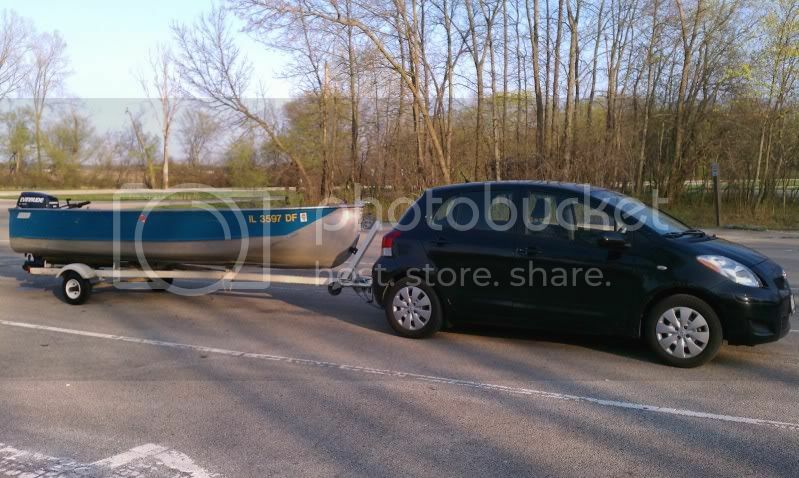 I've had 5 people and a dog in the car when towing this boat, but that was just a couple blocks to the launch. Boat pulls good and when coming out of the water I have everyone get out of the car when pulling it up and works just fine. Ive hauled 1,000lbs of scrap on a 4x8 harbor freight trailer and would be the most I want to pull with this car. I wouldnt hesitate to drive the car a distance with the boat because it really does pull well. Just give yourself extra stopping distance if you have extra people in the car with you. As to a previous post whats the difference if weight is in the car or being pulled. It is the same to me. 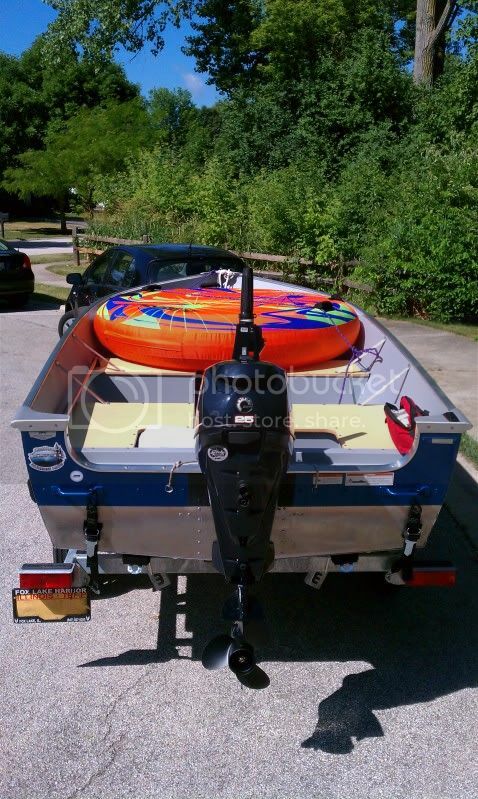 My boat I just sold(about 150 lighter boat, much lighter 100lbs? Trailer also). I did notice this was a little less strain on pulling the boat out...but not bad. That type of trailer hitch is common on all sizes of cars all over Europe. What is it about Americans that makes Toyota so paranoid? I have an American made one on mine which is no where near as well made as yours is. Go wonder. "What is it about Americans that makes Toyota so paranoid? "........two words: lawsuit happy. We don't have 'loser pays' as a default concept. Many other countries do. Loser pays means that if you bring a lawsuit against another entity and you lose then you pay the legal bills incurred by the other party. This helps cut down on frivolous lawsuits. Some people almost manage to make a business out of bringing lawsuits and sometimes the only recourse against such a person is getting the person declared a vexatious litigant if the criteria fit, but that can be a difficult task. Last edited by nookandcrannycar; 08-14-2012 at 01:04 AM. Figured I'd give and update as to towing stuff behind a yaris. I have used the 4x8 harbor freight trailer to haul counter tops. Here is 24 sheets of drywall approx 1250lbs worth plus trailer weight. Trailer had a decent tongue weight and take off and stopping didn't feel bad. I did anticipate stops and accelerate slow. Slipping of the clutch was minimal. 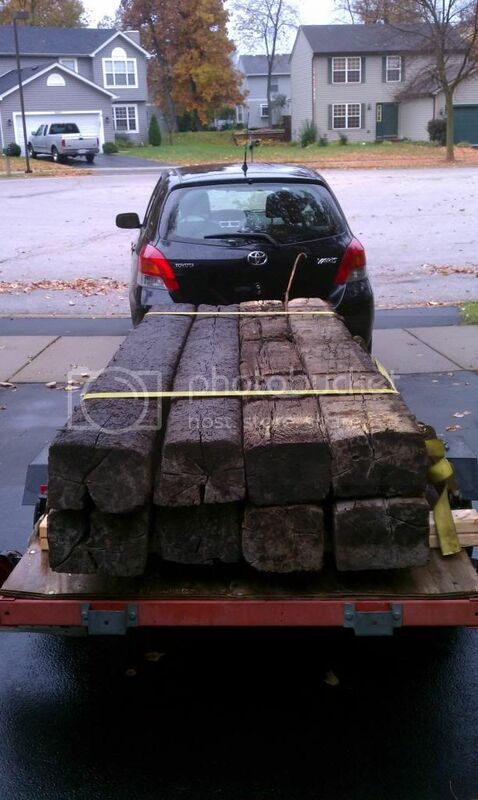 Now for the largest load behind this yaris was 8 used railroad ties (previously rained on). These things are heavy!! I do not know what the weight is but would estimate close to 1500lbs plus trailer. This would be the most I would want behind the yaris. Clutch was more noticeable to slip to get the car going. Once rolling it was fine. It was a short ride with this and plenty of anticipating stops and put hazards on when climbing a hill to be safe along with limiting speed. Being wet out did make me slow down more than usual. 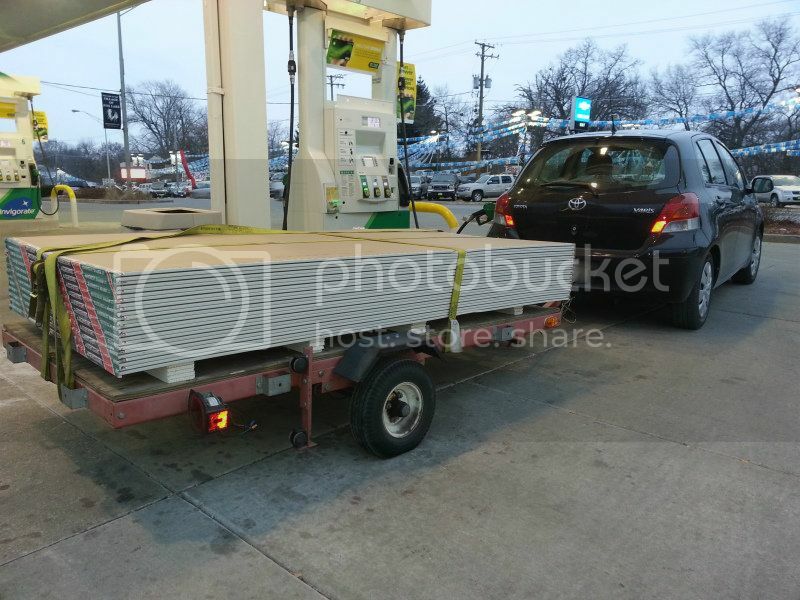 Yaris is perfect for towing and when hauling a large load I just travel by myself. Now if anyone is wanting to try this near mountain areas get trailer brakes or even better don't attempt it! I would not attempt this far travels unless only hauling a lighter load. The drywall 1250lbs did feel very comfortable for a far travel but to be safe I would only want 900lbs on the back so that I don't stress the trailer and have a better stopping distance. Obviously if there were 3 large guys in the car with me when towing I would just tow less. Be safe! ^ have u thought of getting a pick up truck? 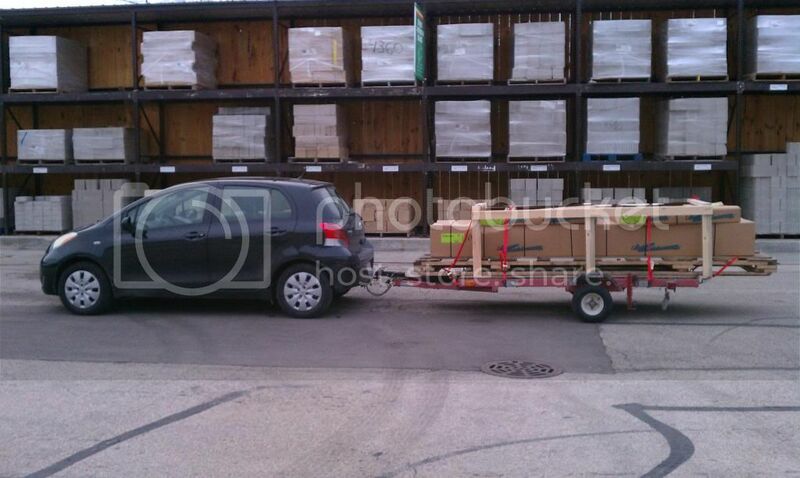 you do alot of hauling, Cool to see the Yaris could do it. 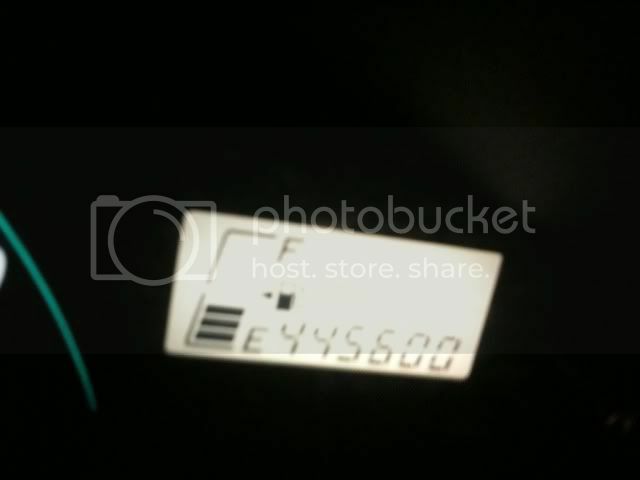 What were your MPGs durring those hauls? Going to pick this up 100 miles away plus coming back 100 miles with the ski hooked to the yaris got me 40.4 mpg overall. That is with two adults in the car traveling 60-65mph to destination and keeping a slow 60mph in the right lane coming back. I did not feel unsafe when traveling and was very easy to pull this wave runner. Driving the Yaris compared to my vw camper with full drum brakes is complete night and day. I can stop the yaris with 1000 lbs behind it a lot quicker than I can the vw without anything behind it. I agree, the Yaris can tow no problem, just drive it accordingly like you do, and ignore the lawyers! 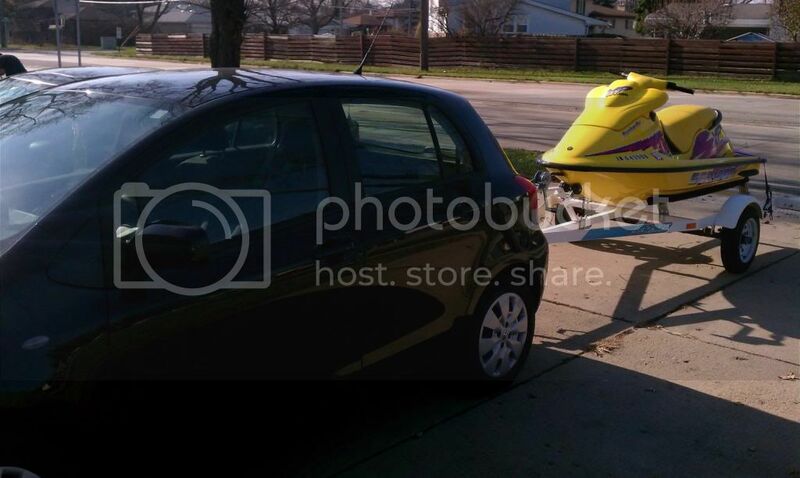 That jet ski looks pretty cool behind the Yaris! Since I have a 2000 RAV4 with a hitch, and a 1 ton Dodge flatbed, I havn't towed with my Yaris yet, but heck yeah, occasional use, flatter ground, driven right, I wouldn't hesitate. This is coming from someone who used to carry 50 lb bags of dog food, 10 gallon propane tanks, a folding full size mt. bike, and lots of other gear usually not seen on a Goldwing. I got the same thing: get a pickup! I had one, it got 11 mpg, the Goldwing got 35, the Yaris gets 40+. I towed this motorcycle (plus gear , we're talking about 600 lbs) from NY to CA, averaged 28 - 35 mpg with zero issues, just slip the clutch when starting, keep the RPMs a little higher on acceleration and be smart about braking downshifting (think driving a mini semi) and you'll have no problems, I used the bolt on curt hitch. I want a truck but it's hard to justify when you have a perfectly good trailer and can get mpg that a pick up can only dream of. I witnessed a yaris pulling a (estimated) 16' fiberglass boat with a 25hp outboard a couple of weeks ago. I have a small, light-weight utility trailer I would like to tow. How do you tap into the Yaris to hook up a trailer wiring harness? I have removed both tail light panels. There is absolutely no slack in the wires to pigtail. Even a 3M wire tap connector will not fit correctly! I would appreciate a reply (maybe with photos) on how you were able to tap into the Yaris' wiring. the hitch is rated for 2000lbs 200 tongue, so why not? You guys are making me wish I didn't have the Rav4 (I carried two 3'0" prehung doors and 2 3x3 windows in it the other day, only the drivers seat in it) and the Dodge flatbed! I would be eyeballing some all aluminum flatbed trailers that are out there, expensive yeah but nice and light.http://www.fthr.com/atv-trailers-rec...3-atv-trailer/ Good on you for getting the most out of your Yaris, keep the pictures coming! The other day I had a 245 watt solar panel to deliver 100 miles away, 65" x 40", I used the Rav and got 26+ mpg, I had it in the Yaris earlier but it was a real tight squeeze, I had to move the drivers seat up way far and no room for the dog. BTW I'm not bragging about that 26 mpg, but complaining.... I would have saved 12 bucks taking the Yaris! I bought one so that I can swap the hitch/harness over to the wife's sedan if need be, without chopping up the wires. I'll post up how it works out when it gets here. Yaris towing???? 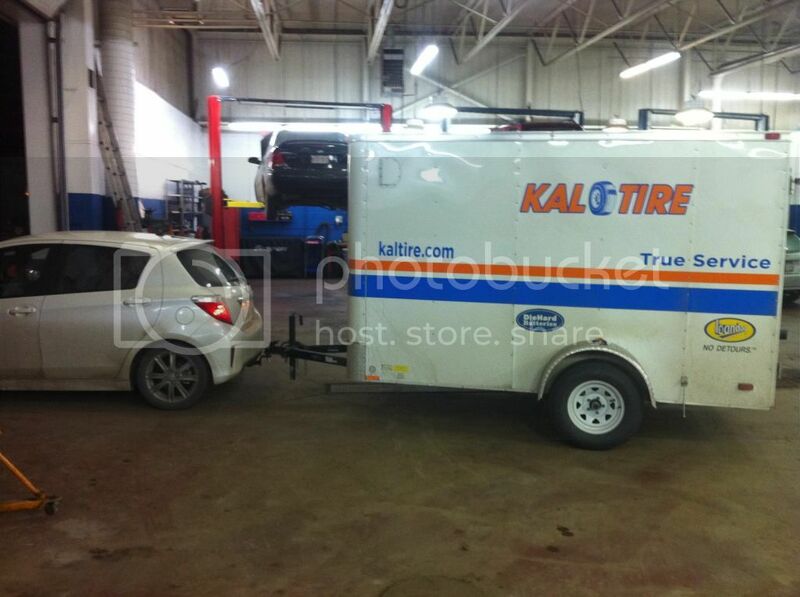 Shouldn't be a problem if a VW Bug with half the HP can go around the world towing a trailer. Small trailer, but seems there was no problem. 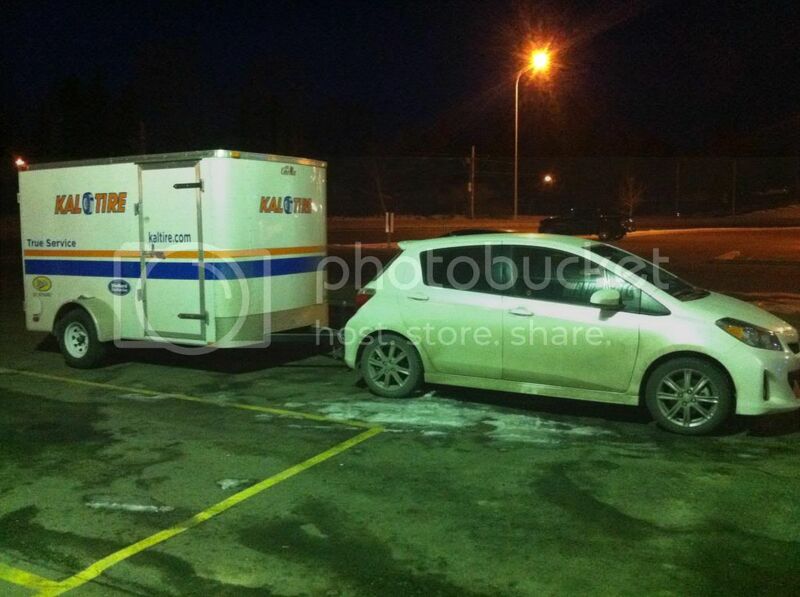 Herbies trip should put an end to the naysayers re: small cars towing trailers. Damn, that is pretty impressive! Pulling is usually never the issue. It's stopping. I am just about spellbound by what they are doing. I have one friend who has traveled 'off the beaten path' as much as they have, but by the time they are finished they will surpass him. Plus my friend did very little driving during his trips. The driving the Herbie couple did appeals more to me. I (at some point) want to look at parts of their path (in a map scale that shows far more re specifics) and emulate some of it. I think a rare combination of the girl, the car, the languages they speak (I would imagine both speak English and German and she might speak Arabic (and one of them might speak one romance language, which would help with the others. I would also guess that he is probably pretty handy re fixing air cooled and probably other VWs all contributed to their safety and ability to continue. I wonder if they got permission fron Disney? Somehow I doubt it, but I think Disney would garner negative publicity if they went after the couple.